Do the Scriptures Authorize Multiple Cups? 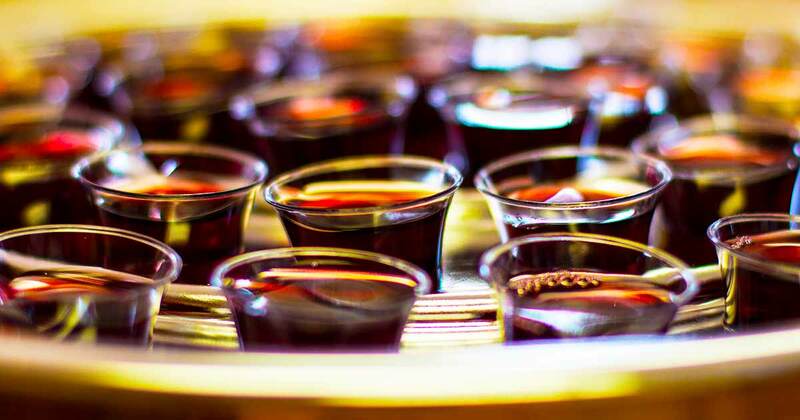 Why do so many churches use a plurality of “cups” in administering the Lord’s supper, when the Scriptures appear to authorize just one — “a cup”? There are some Christians who firmly believe that using more than one container in observing of the communion supper is a violation of divine law. Sincere though these folks are, their approach to the Scriptures in this regard is flawed. When the New Testament speaks of the cup in the observing of communion it is not the literal container that is under consideration, Rather, it is the contents (i.e., the fruit of the vine) that is in view. This is evident from the following factors. There is a common figure of speech in the Bible called metonymy. The term means “a change in name.” This figure is employed when one thing stands for another. One form of metonymy is where the container is put for its contents. This means that even though the container is mentioned, only the contents are actually under consideration. For example, the Scriptures affirm that Noah prepared an ark “to the saving of his house” (Heb. 11:7). Here the container, a “house” stands for the family that dwelt therein. In another well-known passage, Jesus affirmed that God “so loved the world” that he gave his Son for it (Jn. 3:16). It is not the material globe that is in view. It’s the people of the earth are the object of divine love. This is metonymy. There is clear evidence that this is the sort of usage that is employed with reference to the communion cup. “And he took a cup, and gave thanks, and gave to them, saying, Drink ye all of it; for this is my blood of the covenant, which is poured out for many unto remission of sins. But I say unto you, I shall not drink henceforth of this fruit of the vine, until that day when I drink it new with you in my Father’s kingdom” (Mt. 26:27-29). It is quite obvious that the fruit of the vine is the “this,” which is the “it,” which, in fact, is the “cup.” Underline these various terms and the connection between them will be quite apparent. That the cup is not the container is even more vividly depicted in Luke’s record. He states that Jesus “received a cup, and when he had given thanks, he said, Take this, and divide it among yourselves” (Lk. 22:17). The Greek word for “divide” is diamerizo, which means to “divide up” or to “separate into parts” (cf. Mt. 27:35). Were the disciples to divide a container? Of course not. They were to divide the fruit of the vine. How? Most likely this was facilitated by multiple containers. “The distribution (diamerisate) may have taken place in two ways, either by each drinking from the common cup, or by their all emptying the wine of that cup into their own. The Greek term would suit better this second view” (1879, 289). That the term “cup” is not to be pressed as a container is evident from Paul’s use of the term in one of his epistles. During the apostle’s three and one-half year residence in Ephesus (Acts 19:1ff), he penned a letter to the saints in Corinth, across the Aegean Sea some 250 miles to the west. Therein he said: “The cup [singular] of blessing which we [plural] bless” (1 Cor. 10:16). Note the terms “cup” and “we.” It is obvious that “cup” cannot refer to a container, as evidenced by the fact that Paul in Ephesus and his brethren at Corinth were sharing (note the “we”) the same cup (i.e., a common substance — fruit of the vine), which reflects a spiritual idea, namely the blood of Christ and not a common container. Moreover, in the context just cited, just as Paul uses “cup” figuratively, so also does he employ the term “table” symbolically (1 Cor. 10:21). It is no more logical to press the idea that cup (i.e., container) has some mystical meaning than it is to insist that the table has a spiritual significance. A reasonable interpretation of the scriptural data relative to the Lord’s supper would indicate that the use of multiple containers in the distribution of the fruit of the vine is an optional expediency that may be employed at the discretion of the worshipers. This expediency accommodates the larger crowds of today’s church. It perhaps facilitates disease control, the dangers of which were unknown in earlier times. To create division within the body of Christ over the issue of how many containers must be used in the distribution of the fruit of the vine is an error of serious import. What Are Transubstantiation and Consubstantiation? What About a “Saturday night” Observance of the Lord’s Supper? Was the Fruit of the Vine Fermented? Godet, Frederic. 1879. A Commentary on the Gospel of Luke. Vol. II. Edinburgh: T. & T. Clark.